You always know how to look so polished yet casual, I envy that! :) Love the Ink Pashli. And I totally agree about "duty free" prices - they're outrage sly expensive! I hardly ever buy anything in there unless it's an item I cannot find back home. Love the navy Pashli with the gold HW. Can't wait to see your UK haul - nothing beats browsing the aisles of boots. I always have such a shopping list for hubby when he goes to London! Christmas stock still be sold in April? That is crazy! I can imagine how frustrating it must be! If you ever need anything from the UK, I'll be happy to ship them over to you, ha! You look lovely as per. Topshop blazers are the best! TI find the fit to be perfect, espesh with me being such a short arse, ha! I wish I could look so nice when travelling! I love those jeans. Oh, I ..l o v e.. those Zara boyfriend jeans. Sadly they didn't fit me and I had to return them .. sniff. I love this outfit! Casual but chic and really put together! Love this outfit, Laura! The colour of your Pashli is just gorgeous. Oh!!!! 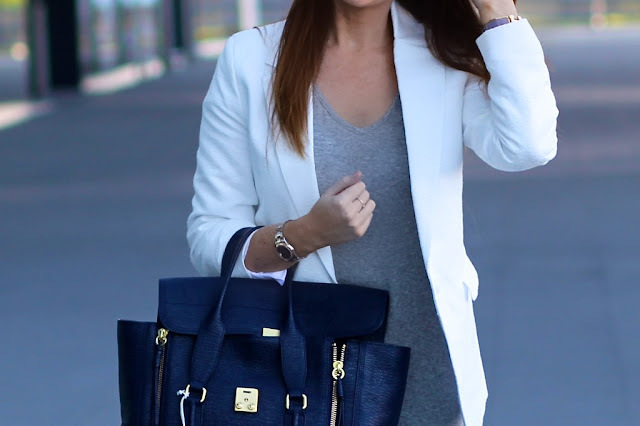 I love the blazer and handbag....I actually love the whole outfit!!! It's really simple, casual yet really, really fashionable and chic!! that's just so true! Dubai's supposed to be the shopping paradise and I actually much prefer shopping in Germany.. I love how you put your pieces together :) It´s totally up my alley! Perfect pulled together airport look that is great for any day! Pretty sure I need to add a white blazer and this grey tee to my closet! ASOS has been amazing this season! Perfect airport look! Not an expat but as a former UK resident I can totally agree with you, I miss Boots and Superdrug SO SO much!!! I love this look - I never look that sophisticated when I fly! And somehow you're making me lust over what would otherwise be 'just' a grey t-shirt! I like how simple yet put together this outfit is :) And your bag is beautiful...Can't wait to see more stuff about Dubai, if you plan to post it! This is the most perfect outfit, looks so effortless yet flawless, the jeans are fantastic. 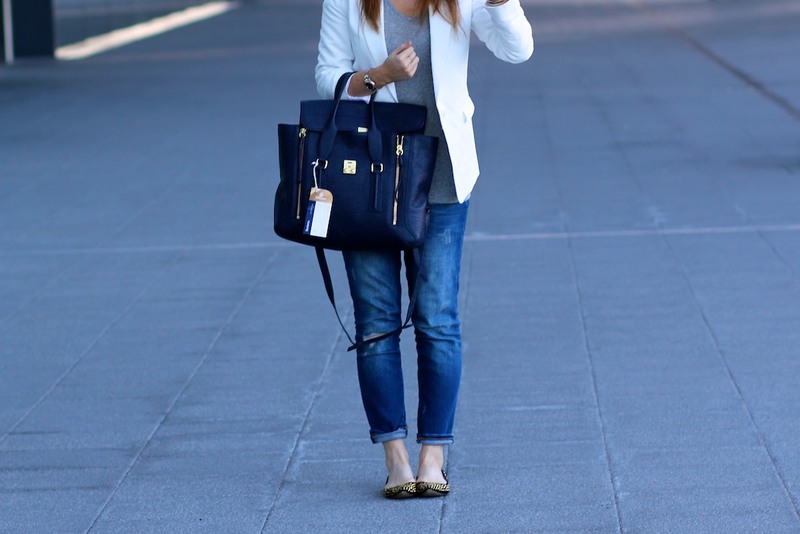 lovely outfit, I've been on the look-out for the perfect white blazer, this one's perfect! You always look so gorgeous. I hope you had a really lovely time in the UK! Love this look, what a awesome blog!